Just a one hour flight from Guangzhou, China is the state of Hong Kong! While a train ride across the border is the easiest and cheapest journey, unfortunately the 72 hour visa exemption requires you to fly back out of the country, meaning I had to take a very short flight over to Hong Kong. First impressions of Hong Kong: London in Asia. It is a very westernised city, with our first destination being Marks and Spencers (so Bee could pick up English essentials that she’s missed after being in China for 6 months). You can find all your British favourites here. I found trying to find good accommodation without paying a fortune quite tricky. Because Hong Kong is full of tower blocks, many apartments or ‘hotels’ may be located in these neighbouring local residents. Be careful as this isn’t always advertised unless you research extensively. On the other hand, most of the better hotels are based quite far out of the city centre, which can take quite a while on the metro line. In the end we opted for the iClub Fortress Hill. It was basic but a lovely place to sleep and not too far away from all the main tourist sites, situated in a quirky area- Fortress Hill. 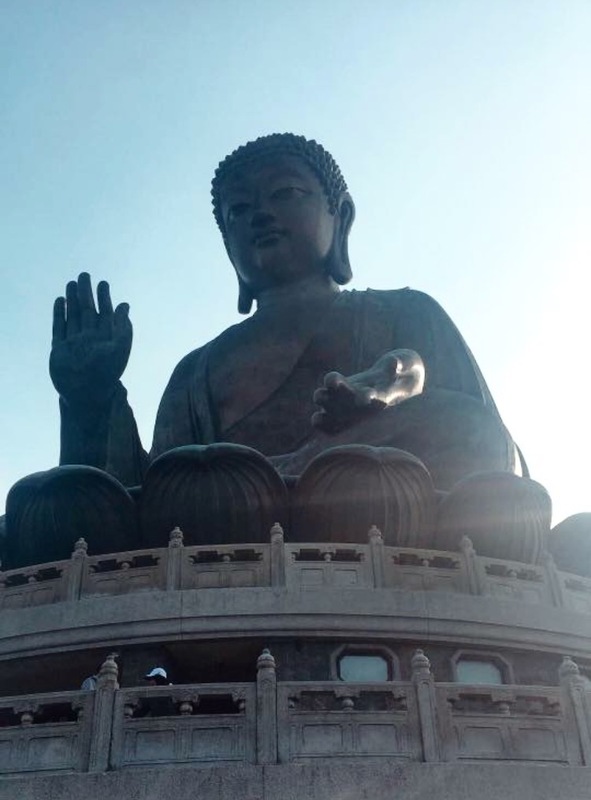 On our first full day in Hong Kong we decided to head to the Tian Tan Buddah located on Lantau Island. Taking the metro line all the way to Tung Chung station, we then hopped on a cable car to take us up the mountains. These can get fairly busy, especially coming back down the mountain, so be prepared to wait a little. The cable cars gave such an incredible view of the Hong Kong islands! It was a dream and such a brilliant way to arrive. There are other ways to get there, you can catch a bus, a taxi or even walk. Though I would suggest paying the extra cost to experience the amazing views on the way. Arriving at the top of the mountain, there is a little village full of shops and restaurants. This was the perfect place to stop for some food, we opted for Chicken Ramen. After lunch we headed towards the Buddah, completing the 268 steps to reach the top! It was such a serene place. I walked around the Buddah, stopping just behind where I could see the shore and other small islands. It was the most peaceful and calming place I have experienced. Leaving the mountains, we took the metro to Victoria Harbour to watch the much anticipated light show which happens every evening. I must admit, the show was not as spectacular as I had always imagined, however, being a part of the crowds and standing along the harbour in the midst of excitement was an incredible experience. The show lasts about 15 minutes and is something great to do for free. The following day I headed to the Hong Kong Museum of History. Hong Kong history and the British Empire fascinates me and so I was very excited to head here. The museum is very long, however full of such fascinating artefacts and information. The first half of the museum is very early history ranging from the dinosaurs, something that doesn’t interest me as much as modern history, so I would probably miss this part out if I were to go again. However I did find it all incredibly interesting. I probably walked through the museum quite quickly, stopping for more specific artefacts and this took me about 1 hour and a half, so as a free museum it is a great place to spend a couple of hours. After grabbing some lunch near the museum, we headed to Victoria Peak. We decided not to take the tram as the queue was huge! Instead we jumped in a taxi that was parked up outside of the tram station. This was slightly cheaper than the tram and you still got a really good view of the city on the ride up. Unfortunately the weather was quite foggy and so we didn’t get the best view of the city from the top of the Peak. But there is some great walks you can do. With restaurants and shops at the top there is plenty you can get up to. On our way back down we noticed a bus that drops you at the metro station at the bottom of the Peak and costs literally pennies so we took that. Our stay in Hong Kong was short but certainly sweet. While it was more westernised and a bit pricier than I had expected, it is an amazing city full of culture with plenty of things to get up to. If I were to go back I would love to when the weather is hotter and visit some of the beaches on the different islands as these look incredible!